Some production notes: this will conclude my ground–breaking series on this subject. I received requests not to link self-respecting bloggers to posts of this nature, all I can say is some people don’t recognize greatness when they see it. I would also take requests for subjects you’d like me to cover in the future. The one thing that stands out about public restrooms is that there weren’t that many. There were few maintained by the city in the parks and other public places and that was it. 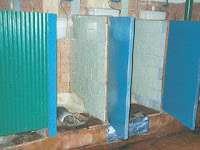 Public restrooms were just as dirty, nasty and smelly as you would imagine. But so were every dark corner and every hallway in apartment buildings that couldn’t be locked. Citizens who did not exercise total control over their bladders and bowel movements found other ways to express themselves. The stench was legendary. The problem was made worse by the fact that there was no fast food or other public places where a person could stop by in case of emergency. Even some popular comedies and jokes of that time depicted someone knocking on the random apartment door and offering money just to be able to use the restroom. Every soviet citizen got the joke. I myself was in a similar situation, although it didn’t seem that funny when I had to do it. After the perestroika many public bathrooms became privatized. Newly minted attendants collected a fee, dispersed toilet paper, cleaned and freshened the air. 20th century luxuries finally made it into the USSR but the country didn’t last very long after that. Maybe the whole foundation of the Soviet system was based on the toilet hardship.